APP FEATURES: ★ Best collection of high definition BhaktiRingtones. ★ 62 Beautiful collection of Hindu God & Goddess HDwallpapers. ★ Set the wallpaper on background to simple click onimage. ★ 62 Different high definition Bhakti Ringtones audiotracks. ★ Show current & total time with title of currentBhakti Ringtones. ★ Set the current Ringtones as Phone Ringtone. ★Set the current Ringtones as Alarm tone. ★ Set the currentRingtones. as Notification tone. ★ Previous/Play/Pause/Next optionsavailable for audio. ★ App can be moved to SD Card from devicesettings. Bhakti Ringtones HD App is the collection of highdefinition Bhakti Ringtones and God & Goddess wallpapers.Ringtones title are given below: → Aisi Subah Na Aaye → BholeBhandari → Duniya Chale Na Shri Raam → Ek Omkar Satnaam → GayatriMantra → Ghar Me Padharo Gajananji → Govind Bolo Hari Gopal Bolo →Guru Brahma Guru Vishnu → Hare Krishna Hare Rama → Hari Om NamoNarayana → He Naam Re Sabse Bada → Jai Jai Raam Jai Shri Raam → JaiRaghunandan Jai Siyaram → Jhulelaal → Kaal Kare Na Usaka → Kanha NeManavo → Kaun Kahate Hai Bhagvan → Maha Mrityunjay Mantra → Man KunBairaag Karega → Man Mera Mandir → Mangal Ki Seva Sun Meri Deva →Nazar Tohe Lag Jayegi → Om Gajanan Namo Namah → Om Gam GanpatayeNamo Namah → Om Jai Lakshmi Mata → Om Jai Shiv Omkara → Om NamahShivay → Om Namo Hanumate → Om Sai Namo Namah → Om VenkateswaraNamo Namah → Prem Se Bolo Jai Matadi → Raam Japo Ji Raam Japo →Raam Naam → Radha Kyun Gori → Radhe Krishna Ki Jyoti → RaghupatiRaghav Raja Raam → Sai Raam Sai Shyam → Shantakaram Bhujagashayanam→ Shiv Tandav Stotram → Shri Sai Devay Namah → Shri Krishna Flute →Shri Raam Jai Raam → Shriman Narayan → Shubh Prabhat Shlok → ShyamTeri Bansi Pukare → Sudama Karib Aa Gaya Hai → SwaminarayanSwaminarayan → Taarif Teri Nikali Hai → Vakratund Mahakay →Waheguru Waheguru ★ Added 12 new high quality bhakti ringtones. ★Added 12 new hd God & Goddess wallpapers. ★ New added ringtonestitle are: → Ambe Tu Hai → Bheja Hai Bulawa → Deva Ho Deva →Gajanana Shree → Jai Hanuman (Female) → Krishna Mantra → Mere SarPe Sada → Om Chant → Pavan Tanay → Sankatmochan Aap Ho → SukhakartaDukhaharta (Aarti) → Tirumal Vaasa So download it and easily sethigh definition Bhakti Ringtones and God & Goddess wallpapersas Ringtones, Alarm Tones, Notification Tones and Wallpaper. Note:Please give us feedback & ratings for support. Thanks. Hanuman Chalisa HD Sound provides audio and lyrics display of LordHanuman Aarti. Hanuman Chalisa HD is a collection of hanuman aarti,Hanuman chalisa and hanuman Song dedicated to Hindu deity, who wasan ardent devotee of Rama according to the Hindu legends. He is acentral character in the Indian epic Ramayana and its variousversions. Hanuman Chalisa HD Sound brings you the feeling of arealistic temple with flower animation in front of you no matterwhere you are. Hanuman Chalisa is hindi poem written by MahakaviGoswami Tulsidas in the sixteenth century in praise of LordHanuman. It is very popular among a lot of modern hindus and isgenerally recited on Tuesdays (considered a holy day for devoteesof Lord Hanuman). ----------------------------------------------------------------------------------- 1. Audio playback ofHanuman Chalisa. 2. Lyrics display of Hanuman Chalisa in Hindi 3.Easy to set Hanuman chalisa Sound as ringtone of phone. 4. On andOff Flower Animation in this Bajrang Bali Aarti. 5. Lots of Hanumanstrot , Hanuman Arti, Hanuman Chalisa, Hanuman song are availablein this app. DailyDarshan: Get free photos and videos of temples like UjjainMahakaleshwar, Kashi-Vishwanath Temple, Golden Temple, mahakal,Tirupati Balaji, Vaishno Devi, Amarnath, Kedarnath, Somnath,Siddhivinayak and much more directly on your mobile, which isposted by mymandir app’s users. Bhajan: Get a huge collection ofHindi Bhajan like Krishna Bhajan, Shiva Bhajan, Durga Bhajan, SaiBhajan, Ganesh Bhajan and many folks deities bhajans as well. Aarti: There are thousands of Aarti videos posted by users. If youfollow any particular God you can get specific aarti videos as well(e.g. Hanuman Aarti, Krishna Aarti, Durga Aarti, Ganesha Aarti,Shiva Aarti etc.) Chalisa, shloka & stotra: Get HanumanChalisa, Bajrang baan, Shiva Tandav Stotra, Krishna Gayatri Mantra,Madhurashtakam, mahakaal Mantra, Vishnu Mantra, Durga Chalisa,Durga Mantra etc. in the form of photos, videos and texts. Religious Knowledge: There is a very rich collection of devotionalstories ( dharmik Katha and pauranik katha). Fast & FestivalsInfo: Get all info related to Indian fast and festivals likePradosh Vrat, Ekadashi Vrat, Ganesh Chaturthi, Janmashtami,Mahashivaratri and much more. Temple Darshan: Daily informationrelated to many Hindu, Jain, Buddhist and other temples posted bythe users. Dharmik Selfie: Share your dharmik selfie with yourfriends on whatsapp, kimbho, facebook, sharechat and on othernetworks. We hope you join us in our goal to connect hindudevotees and temples from all over the world. 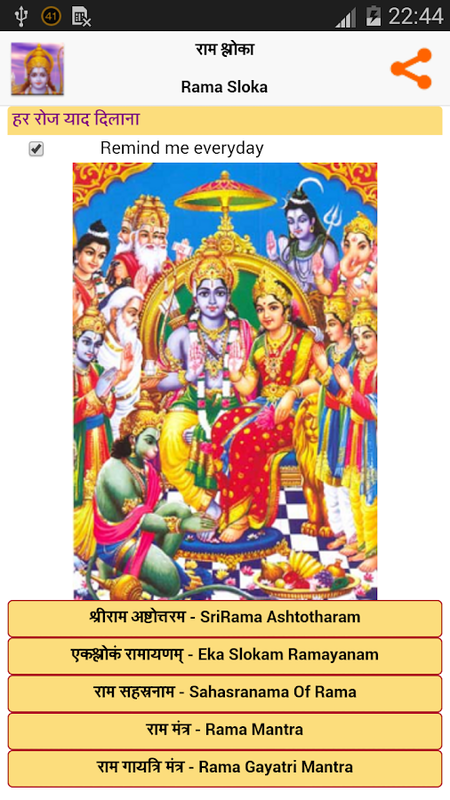 Collection of offline songs, you don't need to connect to internet.Aigirinandini -- Lord Shrinivas ---- "Suprabatham", "Govindaగోవింద", "Srivivasam శ్రీనివాస" "Adi Sesha Anantha Sayana"Akhilanda Koti Harivasaram హరి హరా Nav Graha Stotram నవగ్రహాలు ----Lord Vinayaka --- Ganapati Mantra Parvathi Putrude GanapayyaGayatri Mantra --- Lord Shiva-- Brammamurari Shivam Shivam శ్రీలలితా సహస్రనామావళి Lalitha Sahasranama శ్రీ విష్ణుసహస్రనామస్తోత్రంVishnu Sahasranama Hanuman Chalisa హనుమాన్ దండకం Hanuman Dandakamఆంజనేయ స్తుతి Anjaneya Stuti" Free Download Devotional Songs inTelugu It features Bhajans, Songs, Mantras, & Stotras of allGods. Telgu Bhakti Geetalu is a one stop destination for allpopular devotional songs in Telugu. Thirumala ThirupathiVenkatesha. Sri Venkateswara Swamy Devotional Song SPBalasubramaniam. suprabhatam song,venkateswara suprabhatam,venkateswara swamy songs , sri venkateswara songs , srivenkateswara swamy songs , god venkateswara songs ,God songs,balajisongs , Tirupati Balaji Darshan, lord venkateswara songs telugu ,lord balaji songs , venkatesa perumal songs , venkatesw5ara swamysuprabhatam , venkateswara devotional songs. Harivaraasanam - LordAyyappa: Harivarasanam , also known as Hariharasuthāshtakam. AUMBHOOR BHUWAH SWAHA, TAT SAVITUR VARENYAM BHARGO DEVASAYA DHEEMAHIDHIYO YO NAHA PRACHODAYAT. Gayatri Devi also gave to mankind the"Gayatri Mantra", also known as the "Guru Mantra" or the "SavitriMantra" Ayi girinandini nanditamedini vishvavinodini nandanute.Mantra chanting or even listening to it creates positive energy andremoves negativity. Navagraha Mantra is the mantra of the 9planets. Lord Venkateswara , also known as Srinivasa, Balaji,Venkata, and Venkatacalapati, is an Avatar of the formless supremegod Vishnu. Govinda Namalu Multilingual Lyrics with Audio This Appdedicated to Venkateswara swamy,Venkateswara swamy devotees andTirupathi pilgrim's. Gayatri Devi also gave to mankind the "GayatriMantra", also known as the "Guru Mantra" or the "Savitri Mantra". Best Gayatri Mantra app with the following feature:Repeat Mantrafor 11,21,51 or 108 times.No requirement of internet during use ofapp.Smooth transitions & full of animations.Hindi & EnglishLyrics with the meaning.Text in sync with the audio.Set the mantraas Alarm.Set the mantra as Ringtone.Can use Bell , Shankh &Garlend (Foolon ki mala).Beautiful collection of Gayatri MataImages , which changes itself during use of app.Option to selectimage change interval.Continuos update on the presentcount/Repetition of Mantra.Notify user when run in background.Nopush ads, spam in app. Ram Nam drifting into the air Live Wallpaper: Jai Sri ram Hanumanis a Hindu god, who was an ardent devotee of Rama according to theHindu legends. He is a central character in the Indian epicRamayana and its various versions. He also finds mentions inseveral other texts, including Mahabharata, the various Puranas andsome Jain texts. A vanara, Hanuman participated in Rama's waragainst the demon king Ravana. Several texts also present him as anincarnation of Lord Shiva. He is the son of Vayu, who according toseveral stories, played a role in his birth. Several sectsincluding Arya Samaj believe that Hanuman was a human and notvanara. Other names of Sri Hanuman include: Anjaneya, Hanumanta,Anjaneya, Anjaniputra or Anjaneyudu or Hanumanthudu (Telugu), allmeaning "the Son of Anjana". Anjaneyar, used widely by ruralTamilians. Kesari Nandan ("son of Kesari") Maruti ("son of Marut")or Pavanputra ("son of wind"); these names derive from the variousnames of Vayu, the deity who carried Hanuman to Anjana's wombBajrang Bali, "the strong one (bali), who had limbs (anga) as hardas a vajra (bajra)"; this name is widely used in rural NorthIndia. Bajrang Bali also implies "the strong one (bali), who isorange (Baj) or saffron colored Sang Kera Pemuja Dewa Rama,Hanuman, the Indonesian for "The mighty devotee ape of Rama,Hanuman"